Set in the far future amidst a sprawling feudal interstellar empire where planetary dynasties are controlled by noble houses that owe an allegiance to the imperial House Corrino, Dune tells the story of young Paul Atreides (the heir apparent to Duke Leto Atreides and heir of House Atreides) as he and his family accept control of the desert planet Arrakis, the only source of the "spice" melange, the most important and valuable substance in the universe. 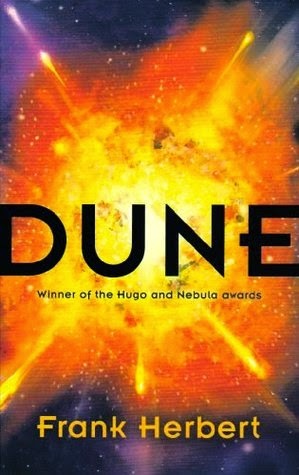 The story explores the complex and multi-layered interactions of politics, religion, ecology, technology, and human emotion, as the forces of the empire confront each other for control of Arrakis and its "spice". So Dune was a bit of a mixed bag for me. On the one hand I enjoyed the desert setting, the fantasy elements, and the entire premise of the thing; on the other hand, I felt like most of the characters were un-relatable, and a large portion of the book felt like something of a chore to read. I’ll start with the positives: I loved the beginning of the book. I found myself warming to the main characters Jessica, Paul and Leto, and was intrigued by the mysterious not-quite-explained elements and mythos, such as the gom jabbar and the Bene Gesserit and the Kwisatz Hadderach. I liked how I was thrown in at the deep end, and that the author was clearly intending to reveal things gradually rather than just explain it all straight away. Then again, I did feel there was too much exposition at this point, and that dialogue was being used a little too much to try and convey some of the background; I felt like the characters were unnecessarily talking about things for the sake of the reader. And the mysterious things that started out so intriguing? They actually got quite annoying the more the book progressed. I got the sense that I was being excluded from something, and while this doesn’t always bother me (it’s pretty much one of the hallmarks of Steven Erikson’s Malazan Book of the Fallen, my favourite fantasy series of all time) it really started the get on my nerves here, to the point where I’d grind my teeth any time the words ‘Bene Gesserit’ or ‘prescience’ were mentioned. Anyway. I loved the way the beginning of the book conveyed a sense of total upheaval, how the protagonists were literally transported from one world to another within a matter of pages, and that this new world was totally alien and hostile. One of my favourite scenes in the whole book happens around this point: Leto, the ‘thopter, the sandworm, the spice factory, the daring rescue . . . I loved this scene. It’s epic. But . . . then I felt like the book sort of went downhill. I (kind of) get why Paul doesn’t have much personality, but it still makes for an incredibly unsympathetic protagonist. I think in some ways all of the characters suffered from this: I felt like I was watching them do things, but I was ignorant as to why they were doing them. As such, I felt disconnected from all of them, which made me less invested in the story as a whole. I was pretty interested in the Harkonnens; however, I really felt like they could have been fleshed out a lot more, particularly the Baron: I felt he was a rather disappointing villain, two-dimensional and defined only by his greed and his homosexuality (which I also disliked, since it’s presented very negatively). I would’ve liked to learn more of the feud between the Atreides and the Harkonnens, and instead felt that the scenes with the Baron and Feyd-Rautha were a little shallow and irrelevant. Despite all my gripes, I did enjoy the book; just not as much as I'd hoped. I kept waiting for it to turn into something spectacular, and for some reason I never felt it really delivered everything it could have done. There were other elements I enjoyed, such as the setting. The author paints a very vivid picture of the desert planet - although I did sometimes feel like he didn't stress enough about how hot and uncomfortable it must be! - and I liked the whole idea of how the population wanted to change the ecosystem and create a better world. I liked the concept of having to wear stillsuits in the desert - it's a very practical rather than romantic view of the Fremen, and made it a bit more realistic. I also loved the sandworms, although I think I preferred them at the beginning when they were scary, rather than later when they were just used as glorified donkeys. I loved the fantasy (rather than SF) elements, such as the knife-fights and the sandworms; I just wish there had been more of both. To sum up, then: there were plenty of things I liked about Dune, and plenty more that I didn’t. I’ll probably give the second book a go at some point, just to see what happens, and to find out more about those characters I was interested in, such as Gurney Halleck and Count Fenring. I think I’d have enjoyed the book more had I not been reading it sporadically on busy train journeys, which is why I’m giving it the benefit of the doubt and rating it 3 rather than 2. I agree for the most part. Loved the beginning, could hardly bear to finish it. My most disappointing read by a long shot. Wow you know its been so long since I read the book that I can't even pinpoint in my memory the scene you were referencing as a turning point for you. I remember loving this series when I was in highschool I really should revisit it again someday and start from the beginning.